We are well known for building bespoke Figaros for our customers, we take great pride in this work and it has always been the companies flagship service. The process begins with our clients visiting and taking a tour of our workshops, seeing the work we produce and discussing the options which are open to them. Cars are paired to each project and built to order, to exact specifications. We have a standard minimum specification for the bodywork, mechanical work and chassis condition, then offer upgrades to truly personalise your new car. We have been building custom Figaros for around 10 years and our services come highly recommend by our clients and The Figaro Owners club. We are absolutely confident in the standard of our work. Below is a guide to the work carried out on a Figaro supplied by The Figaro Shop. This may vary very slightly from car to car but will to give you an idea of how we spend around 300 hours of labour time and approx £3000 parts. All work listed is guaranteed to be completed, anything else that needs doing will also be completed as part of the project. On top of this all other parts are removed, cleaned, restored or replaced and then re installed. You can also see some of the most popular upgrades. Dashboard top re trimmed in fine Italian leather. The leather is flown in from our approved supplier and hand crafted to the very highest standards available. Seats front and rear refurbished with original shade piping. Carpets re dyed to reflect exterior colour, or custom colours available. All interior white panels media blasted, cleaned and re coloured giving a wipe clean finish. All ivory seals stripped and re coated. New stereo refurbished by Clarion, Level 1, New door speakers. Mp3 lead wired into glovebox. Air conditioner re-gassed and updated from the old R12 system to R134A. Serviced and re oiled. All other interior parts stripped cleaned and re fitted. New brightwork where required, this involves polishing and repairing the stainless steel items, replacing the steel ones and re chroming the remaining parts. Fully wax treated to preserve life of car including all box sections. All our Figaro’s are rust free. This process is carried out on a rolling shell to increase durability. New hood – Top section and rear window surround. We have spent many years developing our hood design to be durable and anti shrink. Bodywork brought up to top standards and a full professional re-spray. We use the latest ‘anti scratch’ lacquers in our bodyshop. We always paint both the coloured area and the white roof area of the car. This ensures the best finish. All paint colour sanded and machine polished to give a high level and durable finish. New distributor cap and rotor arm. Fresh oil, major engine flush. New cam belt, new water pump, cam seals ,crank seals, water pump ‘O’ ring. New brake pads, brake shoes, discs and fluid. Fully road tested, wheels balanced and car set up and tracked. On top of our highly specified renovation programme, many of our clients like to specify upgrades to their Figaro. Custom upholstery including hand crafted Italian leather seats is probably the most popular. 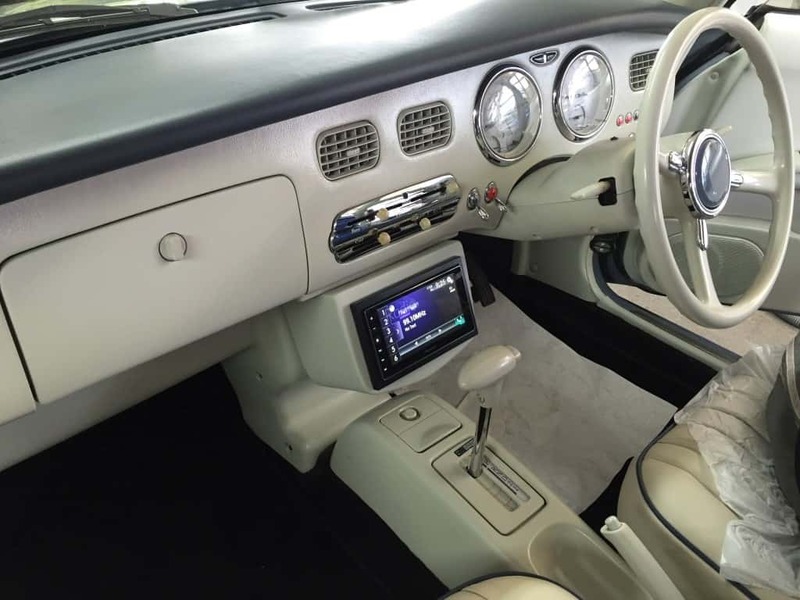 On top of this items such as matching the leather trim throughout the car look amazing, extra chrome and in car features such as heated seats and hands free phone systems are also very popular. From built in Sat Navs to parking sensors we have done it all! Your Figaro is unique, why not make it personal too?